EQUINOX – CYCLES IN NATURE is a collaboration between the Maryland Agricultural Resource Council (MARC) and Washington Sculptors Group (WSG) to develop and realize land art and land use projects through the four seasons of the year, with the primary focus on farming and agricultural issues. The collaboration seeks to generate a diverse and multilayered program throughout the year that examines farming, agricultural themes in today’s societal landscape, and environmental issues through collaborative and participatory creative projects with visitors, volunteers, members, and communities. Artist Jenn DePalma will present the collaborative project Cubes in the second public installation of LAND&ART@MARC: A 4 SEASON PROJECT. Works by Mike Shaffer and Pattie Firestonewere installed during the first project phase in July 2015. During the course of this week, Jenn and her assistant will be building and installing the time-based piece (description below) for its grand opening on Family Farm Day – September 20. Not only is this a time-based land art piece – it also begs for collaboration. Jenn is inviting folks to the Ag Center on Thursday-Saturday to assist in creating the Cubes.If you are interested in getting involved in the project, please contact Jenn directly: moc.l1555988560iamg@1555988560refin1555988560nej.a1555988560mlape1555988560d1555988560. The artist will work at MARC for a week or so installing as many 2 x 2 x 2′ cubes as possible. 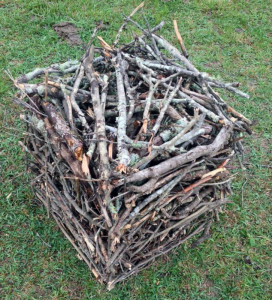 Cubes will consist of corn stalks harvested on site, brush from the pile of sticks and logs, manure found locally, sunflowers harvested on site, wood chips, hay, earth and other various materials found on the site. The materials are tamped into a form and then the form is completely removed. The pieces are held together simply from the tamping. Over time the cube degrades; how quickly the cube degrades depends completely on the materials, weather, and environment. The effort integrates actions relative to farming, the harvest, collection, and storage of materials. The weather and time push the narrative of lost perfection and the whole work spins on thinking inside the box. Volunteers who help build the pieces and viewers who attend opening day will experience the climactic moment when the form is removed and the cube remains. Viewers will able to quietly observe the slow disintegration, literally sometimes watching pine needs fall from the cube or the wind blowing away a leaf or two. Tickets for the 6th Annual Family Farm Day are available here.